Ulrich Teuffel established his company in 1988. 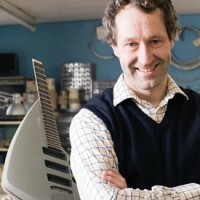 When he ended his studies of Industrial Design in 1995 he came out with a line of concept instruments including the birdfish, tesla and niwa. Despite their modern appearance these guitars always follow the construction principle of Leo Fender, Ulrich’s idol. His instruments do their job in several museums as well as in the hands of artists such as David Torn, Kirk Hammett, Bill Gibbons or Hans Zimmer.